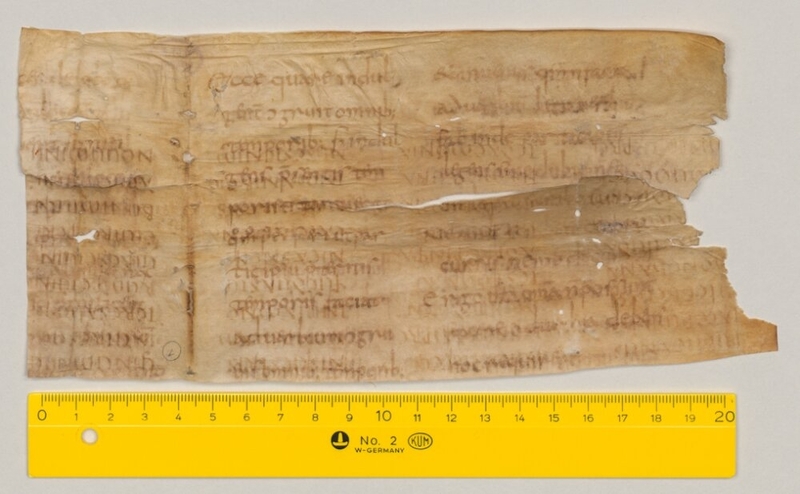 The Register of Old Latin manuscripts is maintained by the Vetus Latina Institute. 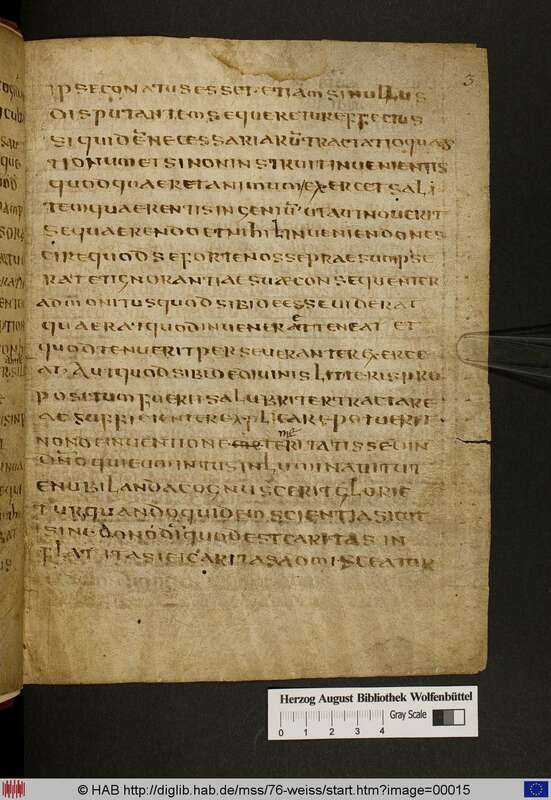 Note that some entries may only have an Old Latin text in certain books; other books may display a Vulgate text-type, or the whole manuscript may contain a mixed text combining earlier readings with a later text. The following list includes all Old Latin gospel manuscripts, with hyperlinks to sets of online images. It is based on the list in The Latin New Testament: A Guide to its History, Texts, and Manuscripts. 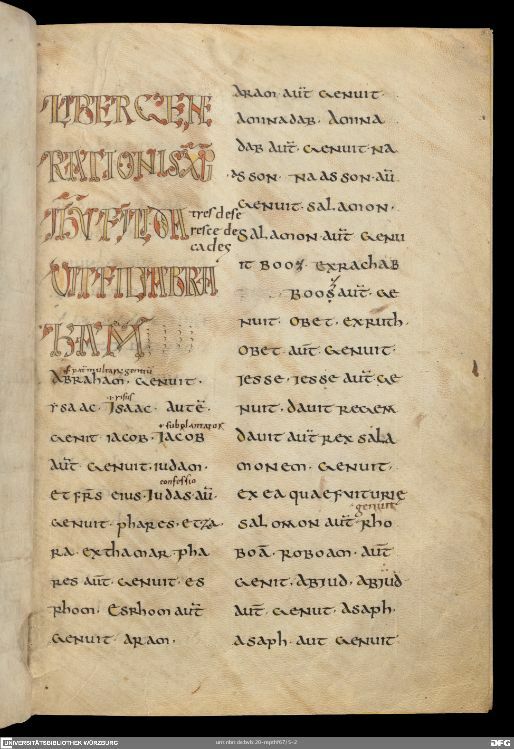 A more extensive list of Latin Gospel manuscripts, using the two letter sigla of Bonifatius Fischer, is also available on the present site here. There is also a concordance of sigla for Old Latin manuscripts in different editions. Almost all of the thumbnail images on this page are provided by a direct link to a host server, hence some may not appear if the address has changed. Please inform the webmaster of any corrections or complements. Portions of Mark and Matthew. Copied in Africa in the fourth century. i) Trent, Museo Nazionale (Castello del Buon Consiglio), s. n.
Four Gospels (Matthew–John–Luke–Mark). Copied in North Italy (Trent?) in the fifth century. Vercelli, Archivio Capitolare Eusebiano, s. n.
Four Gospels (Matthew–John–Luke–Mark). Copied in Italy, probably Vercelli, in the second half of the fourth century. Four Gospels (Matthew–John–Luke–Mark). Copied in Italy, probably Verona, at the end of the fifth century. Four Gospels (Matthew–John–Luke–Mark); 3 John; Acts. Copied around 400, possibly in Berytus (Beirut). New Testament (eacrp) including Laodiceans. Copied in southern France in the twelfth century. The second volume of a Latin Bible, containing the Odes, Wisdom Literature, Old Testament Apocrypha, New Testament (eacrp) and the beginning of the Shepherd of Hermas. Copied in St-Germain-des-Prés around 810. Four Gospels (Matthew–John–Luke–Mark). Copied in Italy in the fifth century. Matthew. Copied in Corbie (France) in the first half of the eighth century. Four Gospels (Matthew–Mark–Luke–John). Copied in England, probably Northumbria, in the late eighth century. Four Gospels (Matthew–John–Luke–Mark). Copied in North Italy, possibly Ravenna, in the sixth century. Four Gospels (Matthew–Mark–Luke–John). Copied in North Italy (Aquileia) in the first half of the eighth century. Four Gospels (Matthew–Mark–Luke–John). Copied in the eighth or ninth century, probably in Brittany. Four Gospels (Matthew–John–Luke–Mark). Copied in Illyria (possibly Sirmium) or Italy in the sixth or seventh century. Four Gospels (Matthew–John–Luke–Mark). Copied either in Ireland around 600 or by Irish scribes on the continent in the fifth century. Four Gospels (Matthew–Mark–Luke–John). Copied in Southern England (Minster in Thanet?) around 775. Holding institution webpage for this manuscript. Four Gospels (Matthew–John–Luke–Mark). 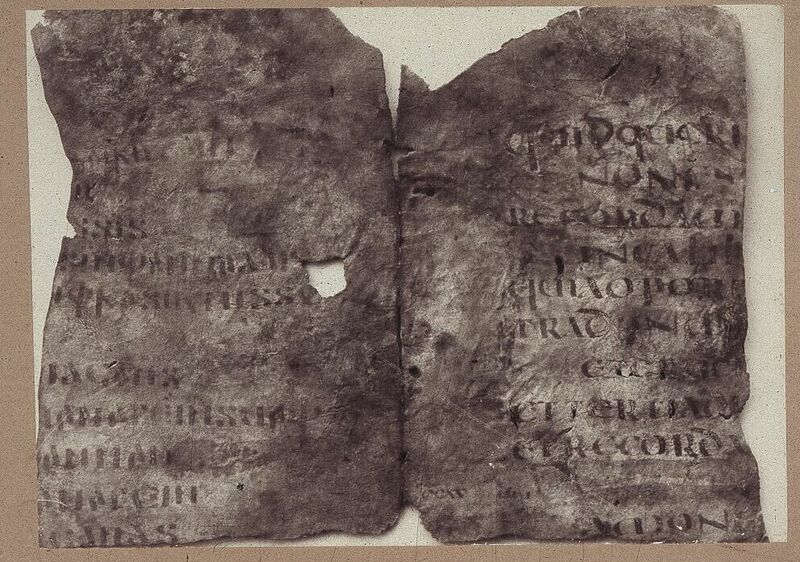 Copied in Italy in the fifth century; v) is a seventh-century replacement leaf. Portions of Luke and Mark. Copied in Italy at the end of the fifth century. Parts of a gospel lectionary. Copied in North Italy in the seventh century, but palimpsested around 800. Fragments of Mark. Copied in the second half of the fifth century, probably in Italy. Fragments of Matthew and Mark. Copied in Ireland or Northumbria in the middle of the seventh century. Fragments from Luke. Copied in Italy in the fifth century. Fragments of Luke and John. Copied in North Italy at the beginning of the sixth century. Fragments of John. Copied in North Italy at the beginning of the sixth century. A fragment of John. Written in the fifth century and found in Egypt, possibly the Fayyum. Johannine lection from a Gallican Sacramentary. Copied around 700 in southern France; palimpsested in the ninth century. A fragment of John. Copied in North Italy or France in the sixth or seventh century. A fragment of Luke. Copied in the sixth or seventh century, probably in Italy. Four Gospels (Matthew–Mark–Luke–John). Copied in St Gall in 860/70. Four Gospels (Matthew–Mark–Luke–John). Copied in Ireland around 800. Four Gospels (Matthew–Mark–Luke–John). Copied in Brittany in the tenth century. Four Gospels (Matthew–Mark–Luke–John). Copied in Brittany around 800. Milan, Biblioteca Ambrosiana, T. 27 sup. A collection of liturgical rites, including biblical lections. Copied in North Italy in the eleventh century. Gallican lectionary. Copied in France (Clermont Ferrand?) in the first half of the sixth century. John. Copied in Italy around 500. Four Gospels (Matthew–Mark–Luke–John). Copied in Ireland (probably St Mullins) at the end of the eighth century. Fragment of Luke. Copied in Italy in the early sixth century, but excavated in Egypt. Destroyed in 1945. Jerome’s Commentary on Matthew. Copied in Lorsch around 880. Four Gospels (Matthew–Mark–Luke–John). Copied in Amiens at the end of the eighth century. The Old Latin siglum refers to the first series of canon tables, which quote the biblical text. Four Gospels (Matthew–Mark–Luke–John). Copied in France, probably in the tenth century. The Old Latin siglum refers to the canon tables, which quote the biblical text. Lections from Matthew. Copied in Verona in the first half of the eighth century. Juvencus, Euangeliorum libri IV. Copied in Wales in the second half of the ninth century. Fragments from Matthew. Copied in Italy in the fifth century; palimpsested in the first half of the eighth century in North Italy. A fragment of Luke. Copied in Ireland in the second half of the eighth century. A fragment of Matthew. Copied in the fifth century in Italy; palimpsested in the late eighth century in Salzburg. Four Gospels (Matthew–Mark–Luke–John). Copied in France in the first half of the ninth century. The Old Latin siglum refers to the text in the canon tables. John. Copied in Ireland around 800. Four Gospels (Matthew–Mark–Luke–John). Copied in Ireland at the end of the eighth century. 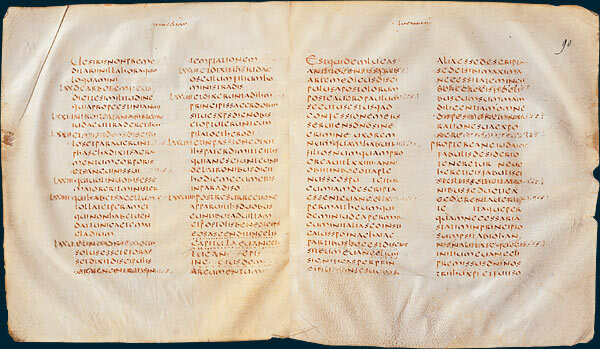 List of manuscripts for the rest of the New Testament: www.vetuslatina.org/NT-MSS.